The framework outlines a standard weed management plan that follows an adaptive management approach and considers risks and adaptation options under climate change. 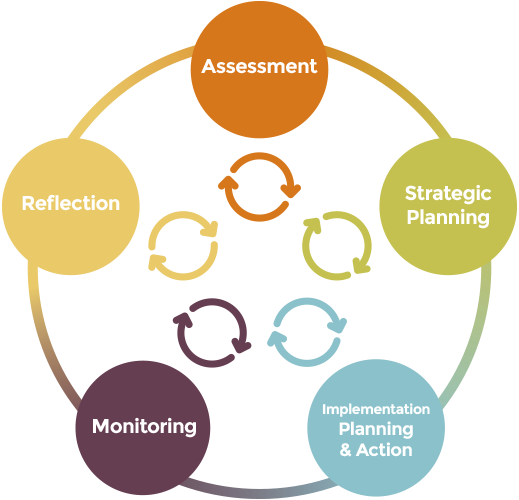 It comprises five main planning components: (i) assessment, (ii) strategy and prioritisation, (iii) implementation, (iv) monitoring, and (v) reflection. Information is provided (in the surrounding boxes) on how each component under climate change may differ somewhat from a generic adaptive weed management approach. Further, each component is considered an iterative process, because the most effective responses to weed problems under climate change may not be known and outcomes may only be achieved after trying a range of options, assessing the responses, and making appropriate changes. General components of weed management planning through an adaptation lens.